Trains are the most enjoyable and comfortable style of long distance travel to date, allowing you to sit back, relax, and admire the view. The journey becomes more than a stressful interlude home and destination or A to B, but rather an experience in itself so the enjoyment becomes about the journey not just the destination. Those wishing to partake in such a splendid form of transport are also spoilt when it comes to spectacular views and awe inspiring scenery. There is simply no better perspective on the world than from a railway carriage. Many of the planet’s best railways feature some of the most beautiful destinations with the European Alps being no exception. Whether you are seeking spectacular scenery, luxurious carriages or heritage steam trains the Alps cater for all. From short and sweet afternoon trips climbing dramatic snow capped peaks or epic long-distance journeys aboard a sleeper train rolling gently through fairytale-esque Alpine scenery here’s a look at our favourite exceptionally scenic train rides of the Alps. The first we would recommend when in the Alps is the notorious Bernina Express. One of just two listed World Heritage lines, the Bernina express twists and turns it way through the imposing mountain ranges agleam with glaciers and chic lakeside alpine resorts like St Moritz to the palms of the mediterranean. Mile for mile, the most scenic journey in the world be sure to complete the full 123km (4-hour) itinerary between Chur in Eastern Switzerland across the border to the Northern Italian town of Tirano. This line is exceptionally popular and you must book in advance. We would recommend travelling out of peak holiday periods if possible to make the journey as comfortable as possible. We can think of no better way to spend the morning absorbing the sights in Switzerland before descending into Tirano for a delicious spot of lunch. For more information or to book your journey on the Bernina Express click here. What springs to mind when thinking of Switzerland? It has got to be Mountains, Chocolate and Trains surely! Well perhaps cow-bells and cheese too, but when in Switzerland you might as well encompass all of these in one fell swoop. What we like to call the “Chocolate Train” starts its journey in Montreux on the chic Swiss Riviera boasting stunning views of the vineyards surrounding Montreux and medieval Gruyères. Talking of wine we cannot resist mentioning its better half (to be debated i’m sure)…. Cheese! The railways passes the Gruyere Castle (in which the cheese was named after) which we highly recommend for a scrumptious indulgent lunch stop! You might as well go to town on the calories and start with an appetizing cheese starter right? Then continue by train to Broc where you will find the magnificent Cailler-Nestle chocolate factory. You can sample chocolates to your inner childs delight before returning home in sophisticated style via a traditional vintage Pullman “Belle Epoque” dating back to 1915 or a comfortable modern panoramic carriage…‘Swiss Bliss’. To find out more about this train journey or to book tickets then click here. 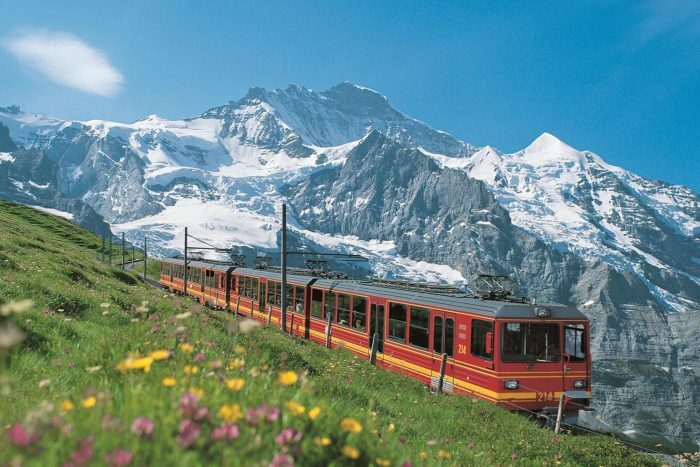 Probably the most well known route is the Glacier Express running between Switzerland’s two most renowned ski resorts. The complete route operates between Zermatt and St Moritz. Known worldwide as the “world’s slowest express train,” it will transport you 291km through mountain landscapes, over high mountain passes and very deep gorges. Passing through 91 tunnels and crossing 291 bridges in about seven and a half hours. Views of the Matterhorn are unrivalled and the pristine landscape of St Moritz a delight. Some of the inclines are so steep that drinks are served in a special tilted glass so as to avoid any slips or spills, trust the Swiss to think of everything! To find out more about the Glacier Express or to book your tickets then visit the Glacier Express website. If you would like to step back in time and explore railway heritage then you are in luck. There is nothing quite like this steam engine paradise in the world, a wonderfully unique experience not to be missed. What makes this even more special is the uninterrupted sublime scenery en route. Covering almost 90 miles and stopping at 48 fairytale worthy towns and villages of Germany’s Harz mountains, this is Europe’s longest steam specific railway. The railway also boasts the largest fleet of passenger steam locomotives, not bad ay? But don’t be fooled into thinking this is just a tourist attraction, tourists brush shoulders with the many locals travelling and commuting on its year-round service, too. For more information about the Harz Railway or to book tickets visit the website here. In the Alps there are also shorter but true to name mountain railways to take you to the high-alpine wonderlands of ice, snow and rock. One prime example is Switzerland’s highest railway station of Jungfraujoch (aka. Top of Europe) at a staggering 3,454m meters above sea level. Riders plough through the dark depths of the infamous Eiger mountain itself where a number of well known stories have unfolded in the past. Once at the summit visitors can admire the Aletsch Glacier and surrounding peaks from the many viewing platforms or the comfort of the Ice Palace. To find out more about the Top of Europe Experience or to purchase tickets then please take a look at the operator’s website here. Perhaps not Europe’s highest railway but climbing Europe’s highest mountain is the Mer de Glace Railway departing from Chamonix centre itself up to the Montenvers station at nearly 2,000m above sea level. The iconic red train is simply magical even without the winter snow and the cog railway is a particular favourite amongst little adventurers as well as big ones making it rather child friendly. Once at the top Mont Blanc and its longest glacier the ‘Mer de Glace’ can be appreciated up close and personal, but also the surrounding mountain ranges and nature reserves of the Aiguille Rouges and Grand Montagne also. Come winter months an exciting Ice Grotto, an ice cave actually carved into the glacier itself can be explored or the crystal museum displaying locally found glacier forced crystals can be admired. To find out more or book tickets in advance visit the Compagnie du Mont-Blanc website here. The Tramway du Mont-Blanc (TMB) found in the Haute-Savoie region of France is the highest in France reaching 2380 m at its top station the Nid d’Aigle (a.k.a The Eagles Nest). Stooped in history and providing spectacular views of Mont Blanc Massif and adjacent mountain ranges the Tramway du Mont Blanc is very popular with sightseeing tourists and hikers. From the very start (Le Fayet Saint-Gervais, 590 m) to the end of the line you are spoilt with views of varying terrain. However, in summer months the tramway also services ambitious high altitude alpinists looking to summit Europe’s tallest mountain, Mont Blanc. Many alpinists take the train before embarking on their Mont Blanc summit attempt via the Tête Rousse and Goûter refuges. During the winter the tramway only reaches as far as the Bellevue Plateau (1800 m) due to the 25 % plus inclines and heavy snow making it impossible out of summer. The railway dates back to the early 20th century (1907) originally serviced by steam locomotives until it was electrified in 1956. Even to this day the line is worked by three motor coaches which are named Anne, Marie and Jeanne (the names of the original railway owners daughters). There was supposed to be a fourth carriage names after the owner’s fourth daughter but this never arrived. To find out more about the Tramway du Mont-Blanc or book tickets in advance visit the Compagnie du Mont-Blanc website.